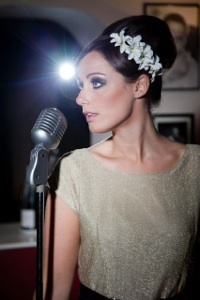 This acclaimed British Jazz/Soul vocalist is an exciting and innovative performer who will add atmosphere and class to any occasion. Her repertoire is a mix of well-known jazz standards, and some unique arrangements of carefully chosen modern songs set in a jazz-style. She is sure to have songs that will both reflect and develop the mood of the event. She can perform as a duo either with a pianist or guitarist. The piano is more jazzy sounding due to the nature of the instruments even though the repertoire is a mix jazz & modern songs. The guitar duo is more modern sounding with a more current repertoire creating a contemporary acoustic “unplugged” vibe. For extra presence and variety, it is possible to add more musicians. A trio with piano and sax works well for smooth jazz, and the full quintet is perfect for jazz with a contemporary twist.